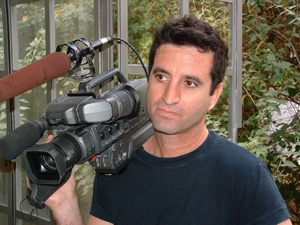 Erez Laufer was born and raised in Israel, and graduated from the Film and Television department at Tel-Aviv University. His film Mike Brant-Laisse Moi T'aime won the 2002 Israeli Academy Award for Best Documentary for 2002, and had its international premiere at the Cannes Film Festival 2003. He has worked on numerous projects with renowned filmmakers Chris Hegedus and D A Pennebaker, including the Oscar-nominated The War Room, a three-part series celebrating Woodstock's 25th anniversary called Woodstock Diary, the documentary Startup.com, and Only the Strong Survive. In 2001, Erez joined with "Steps For the Future," an international collaboration of filmmakers working on an HIV/AIDS film campaign project for South Africa, and in 2003 he joined the Africa 10 team to work on a series of films for the 10 year anniversary of South African Independence. Together with his father, he has recently completed the Darien Dilemma film.